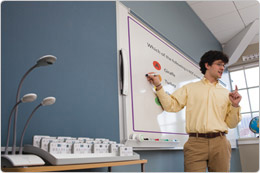 MimioTeach turns ANY whiteboard into an intelligent and interactive teaching board. Ultra mobile device that you can carry from one classroom to another. MimioTeach works with ANY multimedia projector. Import your prepared lessons from Microsoft Presentations or Adobe Acrobat files. MimioTeach can connect wirelessly with a PC or Laptop so you can record your lessons, retrieve them later, or publish them on a hard copy, Microsoft word, or HTML page. Your cost for MimioTeach is a fraction of the cost of other fixed intelligent boards or even modern intelligent multimedia projectors. Removable MimioTeach bar means teachers can easily take it to another classroom and turn an ordinary whiteboard into an interactive whiteboard in minutes.. Combine MimioView or MimioTeach and you get a document camera that let you easily add pictures or live video to your interactive lessons. MimioView is fully integrated with MimioStudio. It comes with a USB port to get power from your PC so you won't have cabling mess. You can annotate images, save them as files for future use. You can do a lot with MimioView while students remain in their seats. As a teacher you like to walk around the classroom while keeping the whiteboard accessible. MimioPad lets you do just that. MimioPad makes it easy for you and students to control the whiteboard remotely. You can write, point or click on the tablet with MimioPad Stylus as if you're beside the whiteboard doing just that. MimioVote is a student assessment system that helps you measure student understanding on the spot with maximum class participation. MimioCapture lets you use dray erase markers on any whiteboard and automatically save what you write, and in colour, on your PC or Laptop. Those saved lessons can be edited, convert your hand writing into font-based documents, modified and saved in varieties of formats including PDF, JPEG, and HTML. You can always switch between MimioCapture and MimioTeach Stylus and the system recognizes immediately which tool you're using.